Another reason I believe Noah Legel has become (and will continue to be) an important voice in the Ryukyu Martial Arts community for many years to come. Here are three very simple and very basic exercises using a makiwara to build short-power. Even though these are very basic exercises, this doesn't mean that experienced karateka can not benefit from them! Indeed, I can virtually guarantee that practitioners who have never tried these exercises can make substantial gains in sort-power relatively quickly by practicing these three methods daily. BTW, this makiwara is made of red-oak, making it relatively stiff. despite being relatively long (the pad height in the video is that of the Sui-Machiwara (Shuri-Makiawara) which is significantly higher than the Nafa-Machiwara (Naha-Makiwara). The Nafa-Machiwara being much easier to use correctly, because the force is delivered forward and -downwards-. Delivering force downwards in a punch is much easier because it flows with gravity and it more or less guarantees decent shoulder alignment. Something which isn't explicitly mentioned in the video is that the elbow-strike covers the right side of the head (which is important when working against a right punch or the jab-cross, especially given that the principle here is a strong entry rather than evasive tenshin). There really isn't anything special on this clip, it is pretty standard Okinawan karate. However, it does examine some useful application concepts, like exploring applications on both the right and left sides, using applications against both single and double punches, looking at how kata addresses the opponent's ability to block your strikes, looking at how tuidi flows naturally from limb control, examining how blocks can function as strikes while still working as blocks (the eye flick) and looking at how kata anticipates the possibility of renewed attack.... With respect to the last one, the final technique on the video uses the elbow strike to wrench the elbow. My gut tells me not to worry about the right hand punching because the elbow wrench turns the right shoulder away from me, meaning he can't land a strong blow with his right hand. However, the kata covers the face anyway... which is brilliant because I might screw up the elbow wrench, or because the blow might catch me directly in the eye-ball, in which case it wont -need- any significant power to have a big effect. That is why I love kata... Kata is just plain smarter than I am. Several years ago I created a number of Facebook groups which were intended for practitioners of Okinawan Martial Arts ("Naihanchi no Kenkyu", "Sanchin no Kenkyu", "Ryukyu Martial Arts [Research and General Discussion]", "Ryukyu Martial Arts [Practical Applications and Training]" and "Hojo-Undo"). We found ourselves making new friends and learning from each other in ways we never expected to. This in turn led to discussions of the possibility of "real world" gatherings in which such an exchange of information could occur... At first this was just a tentative idea floating around cyberspace... until Noah Legel shinshii seized the reigns and decided that it was time to really make it happen! So from October 16th through the 18th 2015, the first ever Ryukyu Martial Arts Friendship Gasshuku (琉球武芸友合宿) was held. Fittingly (given that it was Noah shinshii's initiative that lead to the realization of the event) the first session was taught by Noah Legel shinshii. In this event, Noah Legel shinshii became the first American to publicly teach Kishimotodi. Kishimotodi is an extremely old system of Suidi (Shurite) which which may well be the only non-Matsumura/non-Itosu system of Suidi to survive to today. Its lineage (as respects the gasshuku) is Tode Sakugawa (deceased) to Bushi Tachimura (deceased) to Kishimoto Soko (deceased) to Higa Seitoku (deceased), to Higa Kiyohiko (living), to Ulf Karlsson (living), to Noah Legel (living). Noah Legel shinshii taught a very old version of Naihanchi (shodan) called Tachimura nu Naifanchi" in Uchinaaguchi (or "Takemura no Naihanchi" in standard Japanese. The kata is noteworthy in its use of Keikoken, a heel-down kosa-dachi (also found in Matsumura Kenpo) and the method of transferring from kosa-dachi to Shiko-dachi (moving through a stance similar to relatively short kokutsu-dachi). Noah shinshii demonstrated the 3 main concepts of Kishimotodi: “issun hazureru” (avoid by an inch), “kobo ittai” (attack and defense are one), and “taigi iichi” (body and technique [are] one) very well. It is worth noting that Tachimura nu Naifanchi's footwork is directly related (and basically essential) to the actual applications of the kata. Noah shinshii taught three main categories of bunkai: Nage-waza (throwing techniques), Kansetsu-waza (joint-techniques) and Uchi-waza (striking techniques). For what its worth, both the kansetsu-waza and uchi-waza were very similar to the old-style Suidi I learned from Kuda Yuichi shinshii and Oyata Seiyu shinshii's arts... The Nage-waza on the other hand were unlike any I have learned previously (at least in the smaller but very important details). As a random observation, Motobu Choki shinshii's Naihanchi seems to be midway between Tachimura nu Naifanchi and Itosu shinshii Naihanchi. I think this should be considered deeply. Noah shinshii has obviously dedicated much time and effort to the practice of Kishimotodi and its practical applications. He was a great representative of the art and we are fortunate to have had the chance to learn some of it from him. 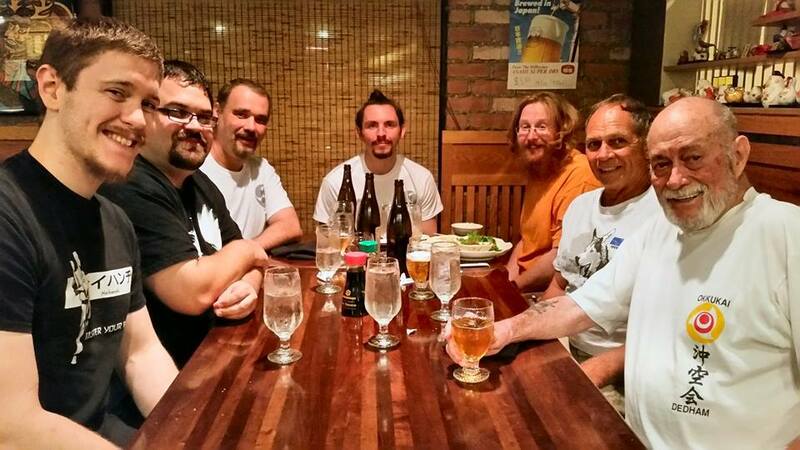 This concluded the first day of study in the Ryukyu Martial Arts Friendship Gasshuku. The next morning it was my turn to try teach. 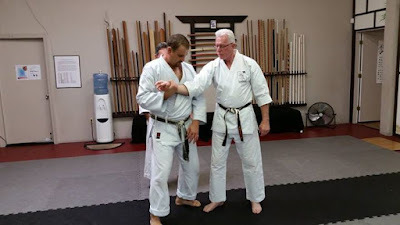 I wanted to teach a technique which was similar to methods shin-budo karateka (modern karateka) would be familiar with which also illustrated the main principles of old-style Okinawan karate. These principles include Miitudi ("partner hands" ie always using both hands in concert, rather than sequentially using one hand after another as in shin-budo karate), Muchimi (a heavy stickiness which is used to adhere to an opponent, mainly without grabbing), Fichidi ("pulling hand", using the hand which pulls to the hip to trap/grab an opponent's arm (clearing obstructions and thus eliminating numerous defensive and offensive options for the opponent), and Tuidi (literally "seizing techniques" which mainly refers to joint-attacks but also can refer to various throws and take-downs). 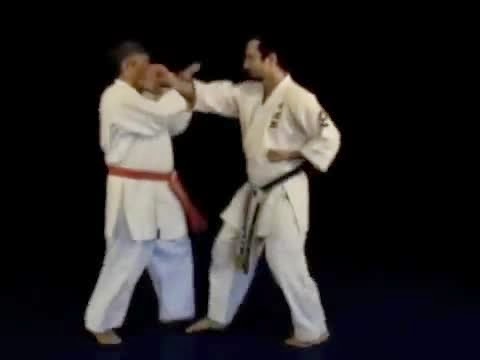 In addition to illustrating such fundamental concepts in Okinawan martial arts, I wanted to explore the parry-pass in greater depth than I had ever seen done publicly. So I taught a single application to the opening of Pinan Godan against a right-punch, a left punch, a left-right double-punch, a right left double punch, a right lead-hand block, a left lead-hand block, a right rear-hand block, and a left rear-hand block. This was done mainly to illustrate how to practice bunkai in light of of Motobu Choki shinshii's advice to move beyond "dead kumite" (ie static attacks) and to practice against an attacker who threw multiple punches as well as somebody who actively attempts to block your counter attacks (and/or otherwise attempts to defend themselves against your techniques). 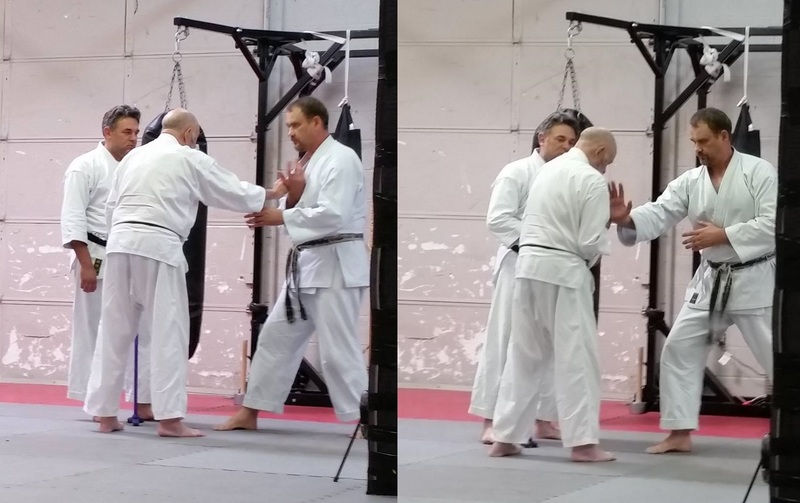 The next segment was a lecture and training session by Chuck Merriman sensei. 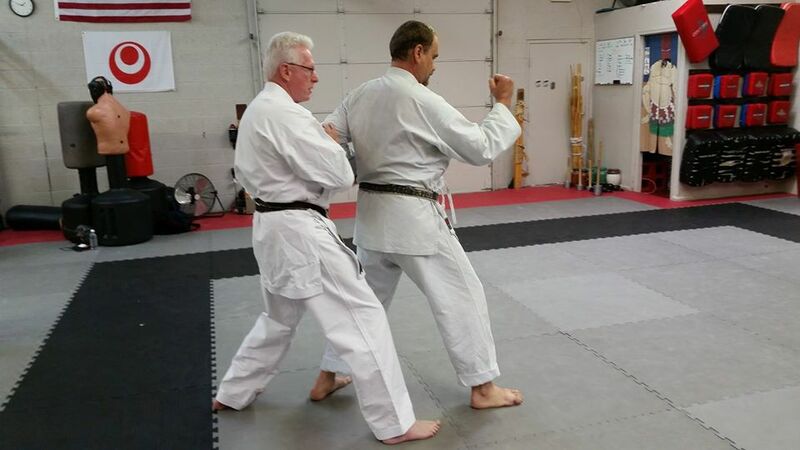 Merriman sensei is extremely well known in martial arts circles, being from one of the early generations of Americans to study the art of karate. As he explained it, Meriman sensei's background in karate seems to have mirrored the history of the art of karate in this country, first learning traditional Japanese karate, then moving on to sport karate as this form grew and evolved, then finally looking more deeply into the roots of karate in its older Okinawan forms... Merriman sensei spent some time explaining the differences between Japanese and sports karate (his roots) and the older approach to Okinawan karate. His observations rang true to me, and this is a man that has drank deeply from all three streams. 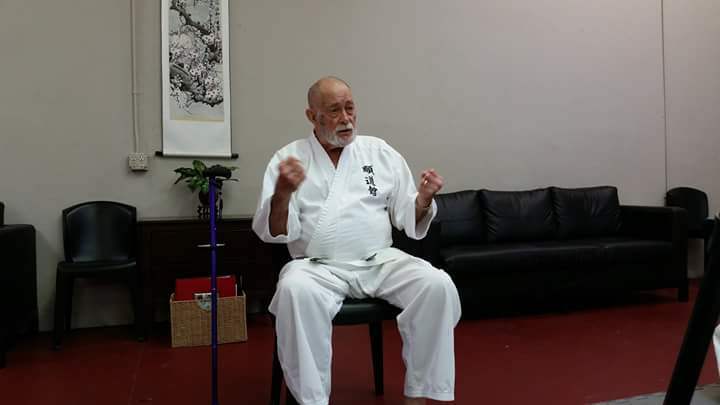 To me the most interesting portion of his lecture was on the "principles of Goju ryu" which I found most interesting in that they seemed to me to be "principles of Okinawan karate". These include the use of muchimi (a heavy adhesive quality which allows one to stick to an opponent), legs deal with legs and hands deal with hands, the use of close-range and grappling applications, and so on... all of which seemed equally true of the Suidi lineage arts I am most familiar with. Merriman sensei then discussed some principles of Kakie (a form of Okinawan sticky-hands practice) and had us practice it together. He even went around the room offering more detailed instruction and offering insights as well as pointers on some of the finer points about basic structure and method. He also took us through some blocking and 4 directional footwork drills. He was assisted by Ed Dinardo sensei, who came with him for his segment. Next on the agenda was a "knowledge exchange" session... Noah Legel and Matt Sheridan played with some muchimidi... I think Matt gained some appreciation for the range Okinawan karate works best at as Noah moved from trapping to elbow-rolls to tuidi and back again. At first Noah dominated the exchange, but slowly took it down in intensity allowing Matt to adjust to the practice... Before long Matt was finding his way and they were exchanging techniques. After this not much training was happening (mostly folks were talking with each other in small groups). 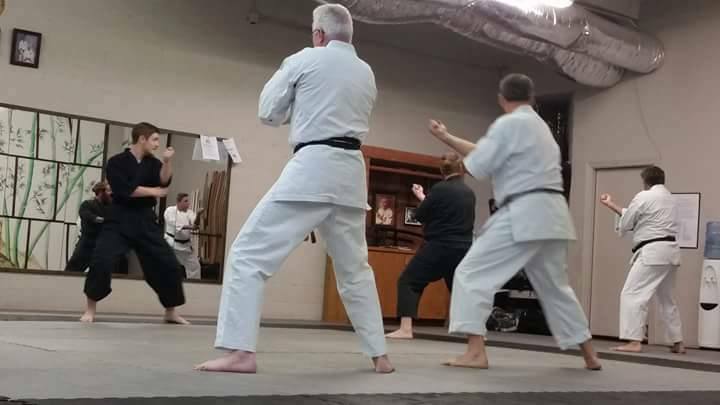 Poage sensei stepped in and started a sort of round-robin training session where folks took turns teaching waza. We then went out to eat as a group (those of us who didn't have other commitments). This (as is usually the case) was one of the highlights of the gasshuku. People let their hair down (literally in Matt's case) and exchange stories... These always have a wonderful sense of comradery in my experience. The next morning Raphael Gutierrez sensei taught Yamane-ryu's Sushi-no kun (aka Suji no kun etc). I've always wanted to be exposed to Yamane-ryu so this was very interesting for me. I have always been intrigued by the fluid repositioning of the hands in Yamane-ryu... Many styles teach Bojutsu with the hands at 1/3 positions on the bo and rarely move them. But from what I have seen, older bojutsu methods are constantly changing the position of the hands along the bo. In Yamane ryu, this seems aimed largely at gaining the maximum amount of power (while maintaining control of the weapon). Gutierrez sensei compared this to how one swings an axe while chopping wood which I think was an especially good analogy. 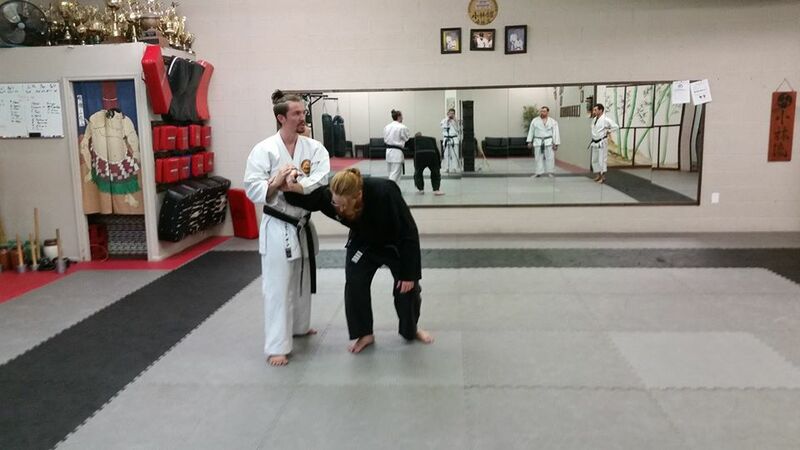 I very much enjoyed this session and will keep practicing this kata. By this point in the gashuku, a theme had developed, namely adjusting the art based on body-type and proclivities... Something which several teachers had already discussed and which Gutierrez sensei also stressed. Ed Sumner sensei (a long time student of the late Chinen Teruo sensei) taught a great segment on the different types of violence (social violence, asocial violence etc) as well as discussing the legal side of the use of force (especially when its not justified and how it needs to be proportional to the situational context). He also pointed out some interesting things about how we should be aware of what witnesses may report about the conflict... all of which was great food for thought, and stuff not discussed nearly enough in most martial arts classes/seminars/books etc. He then discuss how sanchin posture protects the body in various ways, and in fact is an excellent position to work from if you just open your hands and turn them to face your attacker... providing a very safe structure to work out of, while still appearing non-confrontational (getting back to the idea of being aware of what witnesses may report). Great stuff. He taught a number of kumite based footwork drills and a novel approach to four-directional sparring... The four directional sparring seemed quite fun, and I bet it would be a huge success when teaching kids and teens. 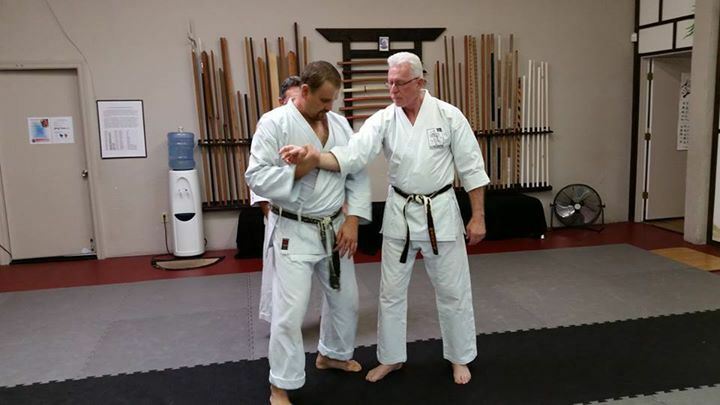 Finally Richard Poage sensei taught Shorin ryu hand drills and bunkai... This material was very similar to the karate I practice. 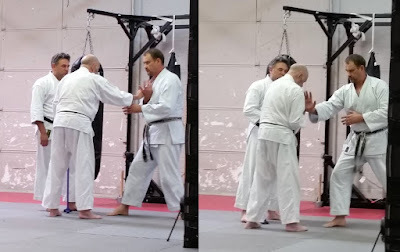 Through most of this session and Sumner sensei's session, my partner was Brian Sagi, who is a gifted and knowledgeable martial artist and who was a joy to work with. Some of my favorite drills were adaptations of a basic kote-kitae drill which is used in almost all branches of Okinawan karate (as well as Chinese, Filipino, and Indonesian martial arts)... He also taught lot of tuidi and lots of "flow striking"... Good stuff. The part which I learned the most from, was Poage sensei's discussion of ways to manipulate the head so as to minimize their ability to resist... but I found it all interesting an enjoyable. Great training session... And nice to end the gasshuku doing material that didn't leave me feeling a bit lost. Here are videos of three Bojutsu systems for you to & compare and contrast. These clips are "fair-use" and are included here for comparison and educational purposes. The first video show the Bojutsu of Oyata Seiyu shinshii (with Rokushaku-bo and Yonshaku-bo). This Bojutsu is from the Ufugusuku (Oshiro) family tradition, and was a system developed for use by Suigusuku (Shuri-castle) guards. The methods employed by these guards needed to include nonlethal force including even methods that could end an encounter with minimal injury (when the opponent post a minimal threat and/or was little more than a belligerent nuisance). The second video is of Isa Kaishu shinshii, and shows the Ufuchiku ("Police Chief") system of Bojutsu. Like the Suigusuku guards, the law-enforcement professionals of Okinawa were expected to be able to subdue individuals who posed only a low to moderate threat without causing serious (especially permanent debilitating) injury. So they also utilized similar entanglement methods and disarms. Finally, the third video is a clip of the Udundi system of Bojutsu preserved by Motobu Choyu shinshii and his heir Uehara Seikichi shinshii. This system of bojutsu is fairly similar the previous two systems, but is more fluid and uses larger and more circular movements with the aim of throwing the opponent (as opposed to just disarming him and/or forcing him to the ground). The method is more sophisticated, but IMO also somewhat less practical, most likely due to the fact that the Udun would rarely (if ever) need to employ their skills and developed increasingly refined methods (that were also more removed from the harsh realities of real self-defense). Continuous motion drills" (drills which are repeated indefinitely in a repeating cycle) and more especially "reciprocal continuous motion drills" (both partners doing the same thing in a continuous cycle) are very useful as a basis for spontaneously inserting techniques. Used in this way they are fundamentally similar to "sensitivity drills" like Chi-Sau, Push-Hands, or Filipino Hubud-Lubud. Most martial artist understand this intuitively, and when engaging in informal partner practice they will often insert a technique or two into the drill. The partner of course tries to counter and the result is a brief exchange of technique before returning to the drill. Pretty much everybody does this when doing -informal- kote-kitae/ude-tanren training. Unfortunately, this is rarely taught as a formal method and its full potential is never realized. Luckily, there are gifted karateka who do understand the potential that these drills offer as formal practice methods. Here is a video with Zenpo Shimabukuro, Dan Smith, and Arman (of the Kill Arman show) doing an Okinawan drill that can act both as a form of kote-kitae impact conditioning and as a kakie-like sensitivity drill. It is very popular on Okinawa and is extremely similar to a drill called "hubud lubud" in Filipino styles. Here is a compilation video I created of various Okinawan continuous motion drills. These Okinawan drills can help develop sensitivity of touch and can provide a basic structure in which to practice close range techniques. Eventually, these drills can/should basically become a form of free-fighting done at close range (ie "trapping range"). This is truly a rare treat. Although I was given access to this video a couple of years ago, it has only very recently been shared publicly. It is footage of the late Oyata Seiyu shinshii teaching a police training workshop at UCLA in 1990. IMO Oyata shinshii is one of only a small number of true masters of old-style Okinawan karate in the 21 century. I recommend studying this video ASAP, because (sadly) many videos of this teacher are only made available to the public for a sort time. Here is a brief demonstration video, also from the early 1990s. In Chinese martial arts there are a plethora of drills, sparring methods, and forms of sticky-hands practice that are performed from a crossed-hands position. Most people are familiar with an iconic scene from Bruce Lee's _Enter the Dragon_ which features this sort of crossing-hands. However, I don't think many people are aware of the extent to which training with this sort of crossed-hands position (often called a "bridge" or an "arm bridge") was imported from Chinese martial traditions into Okinawan martial arts. 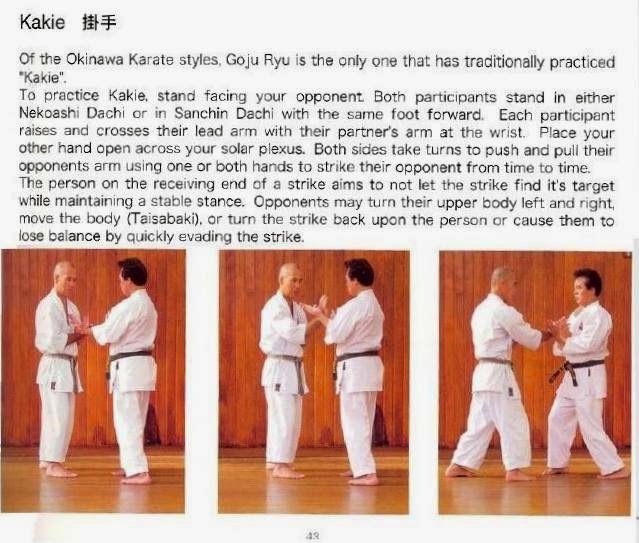 It became a very important feature of "old style" Okinawan karate, but has been largely forgotten in modern karate-do. You block your opponent's strike. Your opponent blocks your strike. Either way we end up with a similar "arm-bridge" reference point. The crossed-hands position just gives us a relatively neutral version of this position to work from. In Okinawan karate there are a number of linguistically linked terms (kakie, kakede, kakedameshi, kakete-biki, and kakiya) that all relate to this crossed-hands position and I think it is perhaps easiest to look at the importance of this position by examining these terms. "However in general terms 掛手 Gua Shou can also refer to sort of a neutral bridge position. Basically kind of like a generic starting position where the arms are sort of hung on each other for any type of sticky hands or bridge based sparring or sensitivity exercise." This is precisely the sort of usage that is referred to in the group of linguistically linked terms I alluded to. Let's start with the best known term and most commonly practiced form of crossed-hands training method, namely kakie. Note the kanji used for "kakie" in Miyazato shinshii's book (掛手) are the same as "Gua Shou". Kakie is a traditional form of push-hands used in Okinawan martial arts. Although widely associated with Goju-ryu, it is also used in various branches of Shorin ryu. Onaga shinshii of Shinjinbukan shorin ryu claims that kakie is the old form of free-practice within "Ti" or old-style Okinawan martial arts, and that its use greatly predates the evolution of modern ryu-ha. He maintains that kakie should therefore be considered the common heritage of all Okinawan karate. I find this view quite persuasive, and I am inclined to agree. That said, the best publicly available resources on kakie have come from Goju-ryu practitioners. Here is a video of Kodo-ryu push-hands practice which I like because it illustrates how kakie can be very soft and yielding in nature. Here is a relatively advanced set of formalized drills for kakie training based on the teachings of Taira Masaji shinshii. I strongly suggest that karateka practice these drills regardless of style. While they were developed by (and for) Goju ryu practitioners, they contain methods that every karateka can benefit from. While this booklet is focused on the topic of kakie it is actually also a decent introduction to many topics in the Ryukyu martial arts and is the best written introduction to kakie and its place in Okinawan MA I have yet to see. Next we should discuss a closely related practice called Kakede (掛け手) [pronounced Kakidi (カキディー) in Uchinaaguchi]. You'll notice that the kanji are the same as those used by Miyazato shinshii for kakie and "Gua Shou" in Chinese martial arts. Kakede is a traditional form of free-sparring that was practiced in Suidi and Tumaidi. Like kakie, it is done from a crossed-hands position, and a variety of close range techniques are practiced from it. Further (also like kakie), it both relies on, and develops, tactile sensitivity. Today, this practice is mainly maintained in the Motobu Kenpo lineage of Motobu Choki shinshii. It differs from kakie in that it does not use the repetitive back and forth motion of the hands. 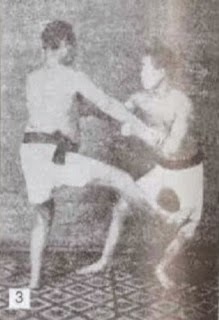 Another difference is that it often uses the Meotode posture to deflect blows with very little movement by relying on the structure of the posture itself in a manner similar to the "controlling center-line" seen in Wing-Chun (and indeed Motobu Kenpo possesses a basic form of center-line [seichusen 正中線] theory). The Meotode posture is in itself an area deserving of some study. Jesse Enkamp has also written about this posture and how it was used (including the idea of deflecting then attacking with the same hand as shown in Dan Djurdjevic's video). Kakede (kakidi) was performed with both partners in the Meotode posture with the hands crossed at the wrist. This forces the practitioners to work on close-range techniques and the fighting occurs within the "reactionary gap" meaning you are too close to rely on visual input alone. Instead one must develop a fairly refined sense of tactile sensitivity which is what allows one to fight effectively at that range. Because of this, more or less constant contact with the opponent is a major feature of this sort of close-range fighting, and limb-control becomes something of an important focus. One of the photo captions describes kakede in an interesting way "A highly intelligent sensitivity based close quarters fighting system inside the reactionary gap, from our Motobu-ryu curriculum. Part of the Motobu Family legacy from the old Ryukyu Kingdom of Okinawa"
From the the official Motobu Ryu Facebook page (please click the picture and read the text in the link). 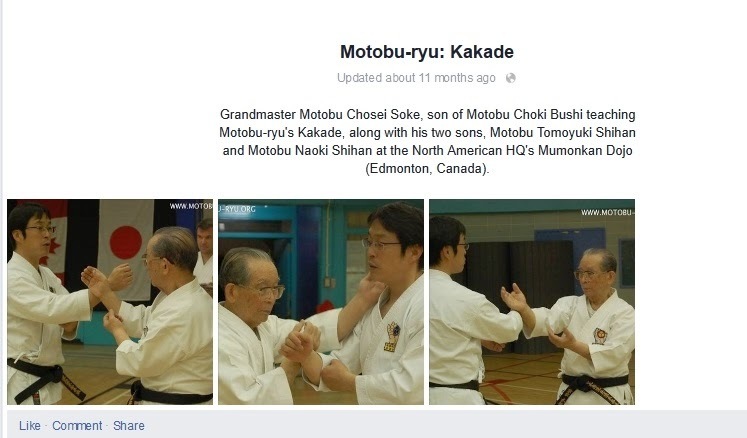 Here is another Kakede link on the Motobu Ryu Facebook page. 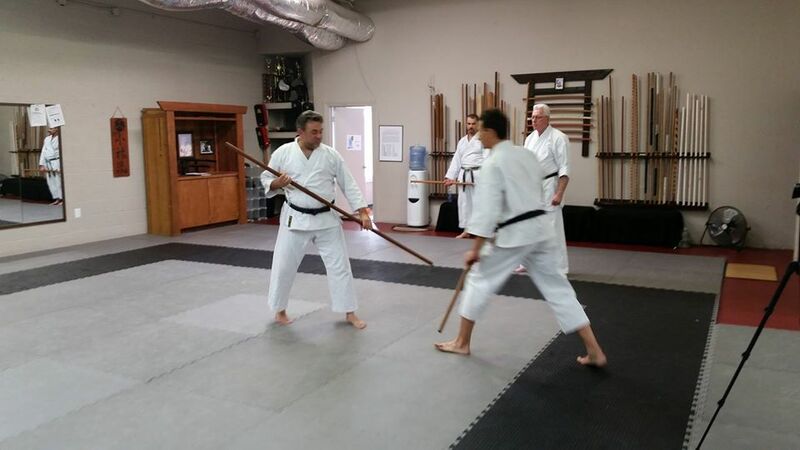 I strongly recommend everybody follow the Motobu Ryu Facebook page. It is a remarkable and invaluable source of historical information on Ryukyu martial arts including especially old-style karate. I want to gratefully thank Motobu Naoki shinshii (the grandson of Motobu Choki shinshii) for very patiently describing and discussing the Motobu Kenpo Kakede (kakidi) practice with me until I was able to grasp it in broad outlines. Your patience and generosity are deeply appreciated. I also want to thank Robert Rivers shinshii for confirming/clarifying a few points as well as adding some additional insights. As an aside, I had suspected for many years that this crossed-hands position was used for free-fighting in old-style karate based on intuition and inductive reasoning. I began doing a substantial amount of my free-sparing from that position and found it an invaluable method of maintaining the general dynamic of old-style karate in a free-sparring scenario (which is quite different from the sporting feel of most free-sparring, which utilizes a much greater distance between partners). I found it enormously gratifying to learn that this intuition was correct and that these methods have been preserved in an unbroken tradition within Motobu Kenpo. It appears that I am definitely not the only one who has had this intuition. 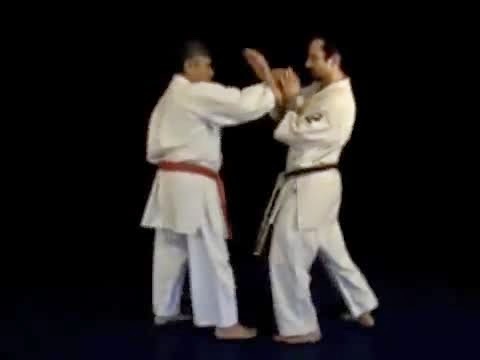 For instance here is a very interesting video from Chris Denwood shinshii showing a variety of limb control methods derived from Naihanchi kata all being done from the Kakede position. Next there is kakedameshi (掛け試し). According to Motobu Naoki shinshii, kakede is normally practiced without any hard contact, and because of this is a very safe and enjoyable method of practicing waza and free-fighting. 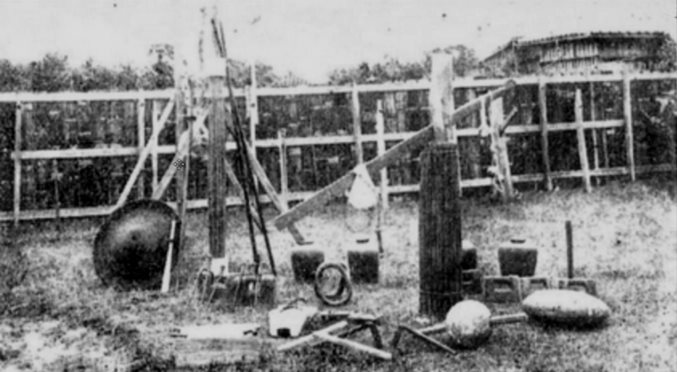 However, there was a closely related form of pressure-testing or challenge-fighting called kakedameshi. Many people believe that kakedameshi was a no-rules form of brawling, but this is not the case. There were some basic rules (which seemed to vary a bit) and people would often bring "seconds" to such matches. There would also sometimes be an arbitrator or referee. According to Motobu Chosei shinshii and Motobu Naoki shinshii, kakedameshi means a "test" or "match" (tameshi 試し) by kakede. While there were some basic rules, kakedameshi was a very rough affair with injuries being common, and fatalities not unheard of. So in essence, it was a form of pressure testing where practitioners could try their techniques on a skilled and fully resisting partner (with heavy contact) that was done in basically the kakede fashion. I can't help but be reminded of the match in the Bruce Lee movie at the top of this post, but of course without the movie drama and theatrics. 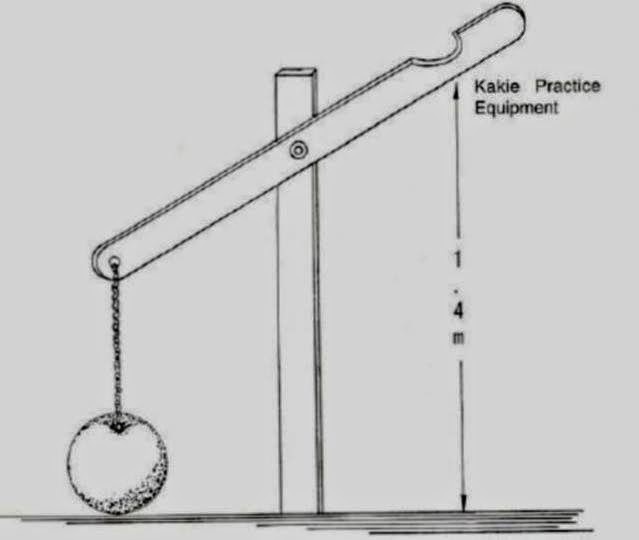 Kakie, Kakede, and Kakedameshi were important practices within old style karate, and working with this arm-bridge position, practicing limb control, and working on close-range fighting was so central to the Okinawan martial arts of the period that a special device was imported from China that allowed for the practice of these methods without a partner. It was a type of wooden dummy which was typically referred to as a kakete-biki ("kakede" puller) in Suidi derived arts and as a kakiya in Nafadi derived arts. It seems clear to me that the term kakete-biki is related to (and derived from) kakede, and that the term kakiya is related to (and derived from) the word kakie. 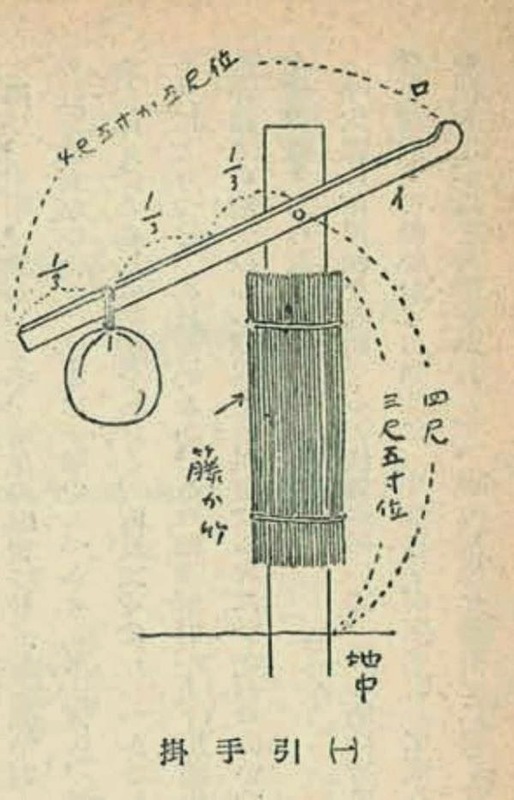 This device was once reasonably common in Ryukyu martial arts and can be seen in many old photographs from both Suidi derived arts (Shorin ryu, Motobu Kenpo etc) and Nafadi derived arts (Goju-ryu, To'on-ryu etc). Designs for building this device were also quite common in pre-war books on karate. However, modern karate-do has completely forgotten the existence of this device. This is obviously because modern karate-do places little or no emphasis on limb-control, making such a device totally superfluous. 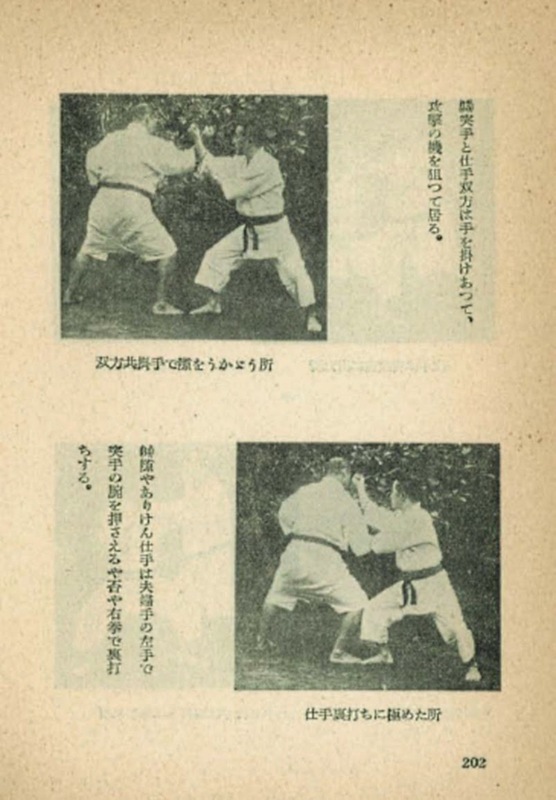 Here is an article on the kakiya by Chris Denwood shinshii. Post by Kara Tetsu Te. Here is a video showing some more very interesting drills . My hope is that by illustrating the importance of the crossing-hands position in older Okinawan martial arts, that I have also helped to shed some light on the centrality of close-range fighting, tactile sensitivity, and limb-control within old-style karate. I also hope the article provides food for thought, new training ideas to explore, and some inspiration to research further. Merry Christmas to all my brothers and sisters in the Ryukyu martial arts. Kuden are "oral transmissions" or "oral teachings" and are very common in martial arts. Of course most teaching is done orally (as opposed to in writing) but kuden are not just the words a teacher says in a given class... Rather they are usually teachings that have been passed down for generations and the phrasing of these teachings is fairly standardized. Anyone who has been involved in Okinawan martial arts for any length of time has heard many of these kuden. Here are 5 kuden which almost every longtime student of Ryukyu martial arts has heard many times. These sound familiar, right? When I first heard these, they sounded like totally separate instructions (some of which made more sense than others). However, over the years it has become clear to me that these instructions are (on one level) all describing the same thing. 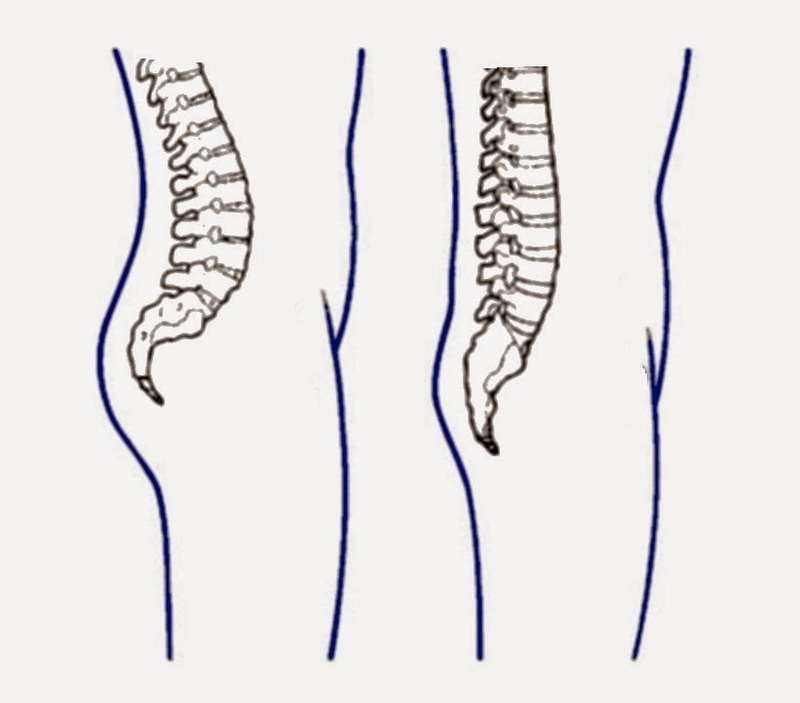 These all refer to aspects of the exact same motion: a pelvic tilt that minimizes the lumbar curve. While all these oral instructions describe the same motion, many of them also have additional aspects. In this case straightening the back requires the pelvic tilt and minimizing of the lumbar cure, but it also refers to minimizing the thorasic and cervical curves. The lumbar curve has the biggest impact on power transmission, but all three curves are straightened to the degree that is naturally possible. Forward pelvic rotation minimizes the lumbar curve, and can offer a degree of protection to the groin. 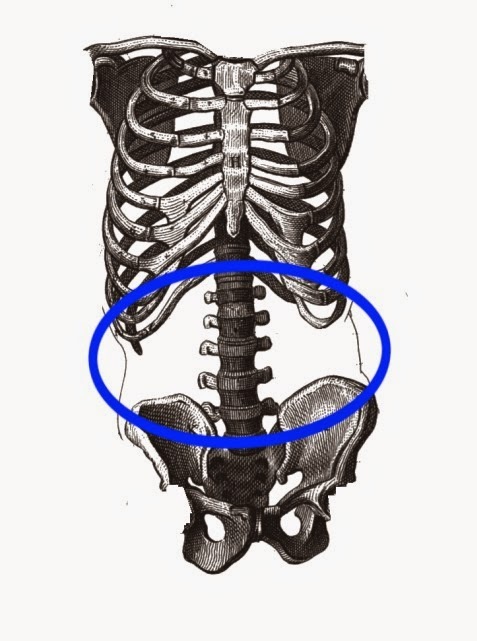 Generally this pelvic action is used in conjunction with the utilization of internal musculature and diaphragms in the lower abdomen (but this is beyond the scope of this article). The main muscles involved in rotation of the pelvis forward are in the lower abdomen, and activating the muscles in the tanden area (putting strength in the tanden) will automatically pull the the pelvis forward (assuming there isn't equal activation of antagonistic muscles like the erector spinae muscles). 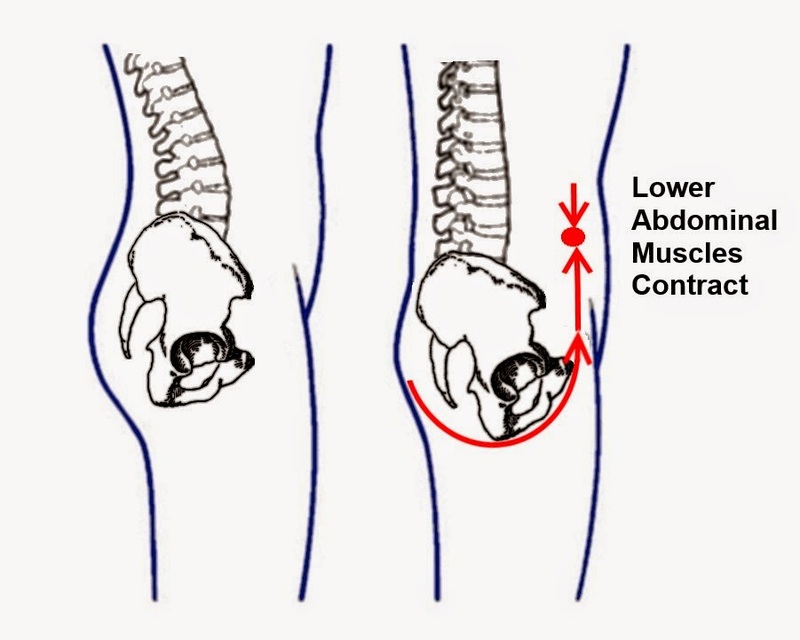 However, the activation of the tanden area abdominal muscles is also important for creating a firmer connection between upper and lower body (discussed below). Practice the pelvic roll several times and pay attention to the muscles of the tanden area.... Did you feel that contraction just below the navel? That is putting strength in the tanden. 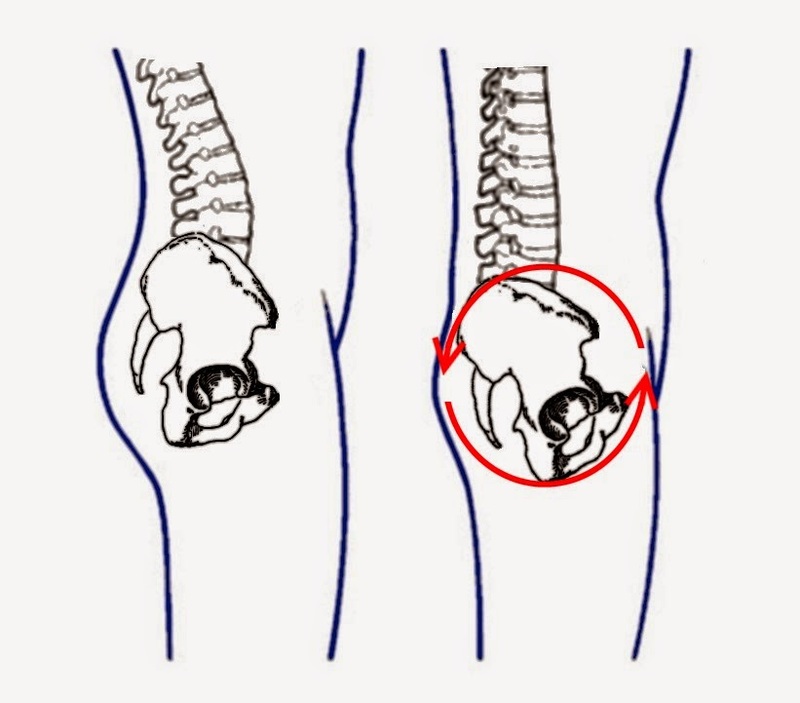 In order to tilt the pelvis forward and minimize the lumbar curve the muscles of the lower back must be relaxed (because they pull the pelvis and back the opposite direction). Utilization of (or tension in) the muscles of the lower back (assuming there is not equal activation of antagonistic muscles) will automatically cause the pelvis to tilt backwards and the lumbar curve to become more pronounced. 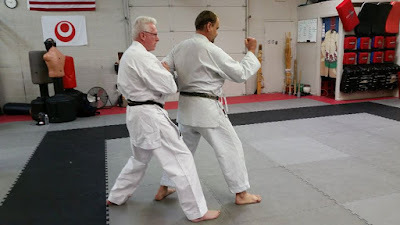 Too much tension in the lower back is unfortunately very common in modern karatedo, and it is not uncommon to see karateka actually leaning backwards while punching. Anyone with even a rudimentary (or just intuitive) grasp of body-mechanics will understand that leaning backwards is totally contrary to the the goal of projecting mechanical force forward (as in a punch). It guarantees one will not hit as hard as one is able to hit, and it compromises the stability of one's body structure (making it easier to lose one's balance). If there was one feature of old-style karate that I could get practitioners modern karatedo to adopt it would be to relax the lower back and eliminate this counter productive backwards lean. Practice the pelvic tilt several times. notice how the muscles of the lower back elongate rather than contract. Next to the tanden muscles, the muscles most most responsible for the pelvic tilt (and therefore also the minimization of the lumbar curve) are the muscles of the buttocks. 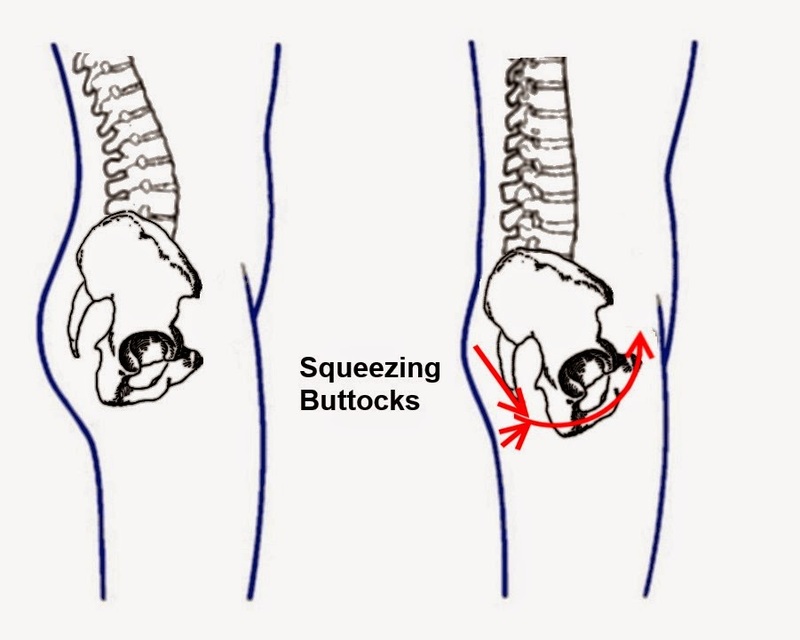 In addition to this, squeezing the buttocks helps protect the groin (to some degree) and creates an internal tension that can be felt along the inner thigh. Practice the pelvic tilt several times, notice how the buttocks are engaged in the motion. OK, now that we have shown the relationship between these five oral instructions, we should at least briefly discuss why a pelvic tilt that minimizes the lumbar curve is important. This can be summed up in one word: gamaku. Gamaku is an Uchinaaguchi (Okinawan language) word which refers to the waist area including the small of the back (ie the lumbar curve). Obviously gamaku coincides closely with what modern fitness gurus call "the core". Gamaku is the part of the body which joins the upper body and lower body together. It is therefore the area responsible for transmitting force from the lower body (legs and hips) to the upper body (including the arms and hands). The reverse is true as well (transferring force from upper body to lower body). Needless to say the area is pretty important both for delivering strong blows and transferring incoming force through the body structure to the ground (rooting). The primary load bearing structures in the human body are bones. One look at the bones of the torso immediately reveals something very important about the gamaku (waist) area. The muscles involved in this squeeze are mainly the external and internal obliques (the external obliques are also involved in the pelvic rotation). 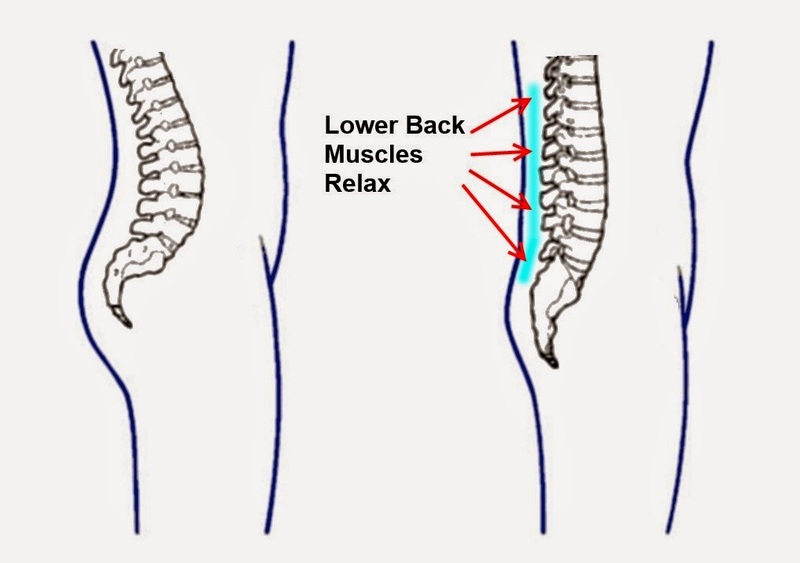 So when you combine the minimization of the lumbar curve, engaging the rectus abdominis muscles, and squeezing the obliques, you've enhanced the structural connection and stability between the upper and lower body. This in turn means that you have optimized the transmission of force from lower to upper body (and the reverse). It is interesting to note that power lifters are well aware of the lack of stability and connection in the waist area and wear specialized belts which stabilize and support the area (minimizing the chance of injury). 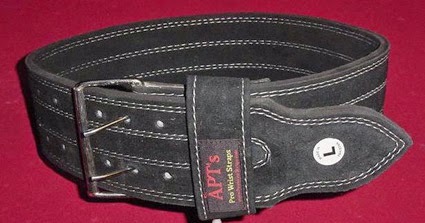 In a very real sense, these belts can be considered artificial gamaku. Now I realize some readers are thinking to themselves "Wait, I thought gamaku was some kind of whipping energy created through hip motion". 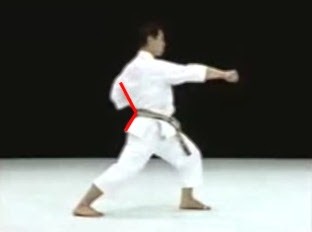 Since these hip motions utilize the gamaku area, they can be considered an application of gamaku, but only if the basic structural gamaku I outlined above is being employed to create a firmer connection between the hips and the upper body. So the above description is "structural gamaku". Hip motions of various sorts can be dynamic applications of this structural gamaku. Another way I have heard it discussed is that structural gamaku is "basic gamaku" and the "whipping energy" can be considered "advanced gamaku" (it being based on "basic gamaku"). It is very important to understand that only a small number of Okinawan martial arts use this whipping energy to a significant extent, but all Okinawan karate uses (or should use) "structural" gamaku. For a more detailed look at the use of gamaku in punching techniques please read my earlier article on the difference between modern and classical tsuki waza. 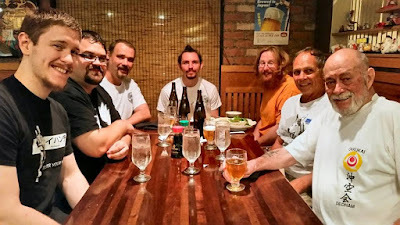 I am happy to present an article by Noah Legel as the Ryukyu Martial Arts Blog's second guest-post. Noah Legel a serious practitioner of the Ryukyu martial arts who has also successfully competed in MMA competition. 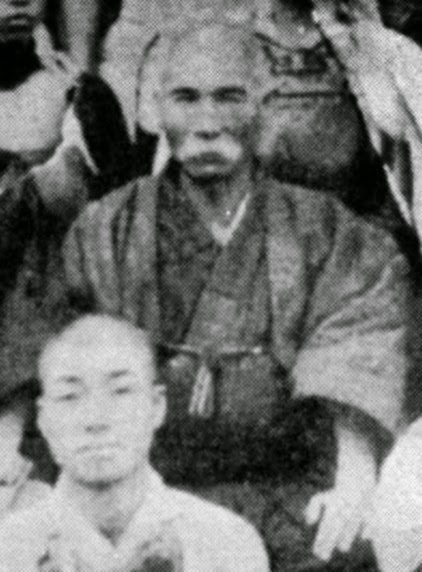 In his blog (Budo no Kaizen), Noah has frequently mentioned examples of the use of old-style Ryukyu martial arts techniques in MMA events. Because of this, and his background, I asked him if he would be willing to contribute something on the topic to this blog. This great article is the result. These men, both masters in their own right, quite clearly stated how Okinawan arts were intended to be used. Despite that, however, there are many techniques and skills present in Okinawan arts that cross over into the competitive realm. Mixed martial arts competition, in particular, lends itself to the use of some classical methods, because of the open-fingered gloves and relatively relaxed ruleset. Over the past couple years, in particular, we have seen MMA fighters focus more on their striking skills, and this has brought some of those techniques to the fore. 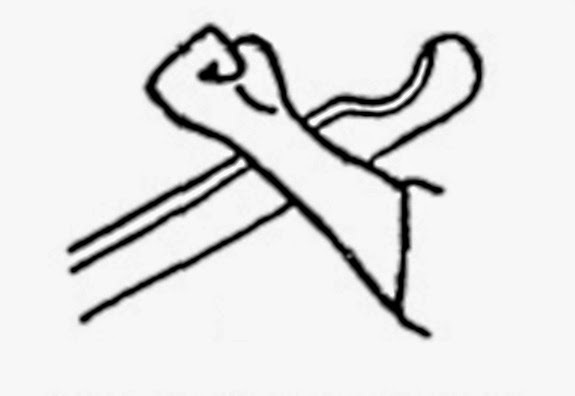 Suki-geri, the oblique/shovel kick, is a staple technique within the Naihanchi kata. It is a rather close-range technique, and can be used to cause pain, off-balance your opponent, dislocate their knee, and more. All told, it is a very useful tool, but up until the past couple of years, it has been relatively obscure in the competitive fighting world. The range at which it is best used it between punching range and clinching range, and most fighters at this distance opt to; continue punching, enter the clinch, or shoot for a takedown. When UFC Light Heavyweight Champion, Jon Jones, started utilizing the kick in his fights, people started to take notice. Around the same time, and increasingly thereafter, more fighters started adding it to their repertoire. Indeed, several fighters from the Jackson-Winkeljohn camp (where Jon Jones trains) were among the first to showcase it in high level MMA competition. Currently, this kick is being used at the end of its effective range, and for the same reason fighters tend to throw the front thrust kick--to discourage and stop an opponent from closing the distance. For long-legged fighters like Jones, this works well. I suspect that, over time, we will see it being used in the clinch, and to wear away at the legs the way roundhouse kicks to the thigh are currently used. Strikes directly to the joint are technically illegal (at least in much amateur competition), but most fighters can get away with them, so we may see a rise in injuries if this kick becomes more popular and they choose to use it in that manner. Kicking with the tips of the toes is a skill that requires a lot of dedication to conditioning, so it stands to reason that it would not be a popular striking method in competitive fighting. Fighters typically train in cycles, and need techniques that can be quickly utilized in competition. As MMA has progressed, some of the more experienced fighters have been able to put in the training time to start using tsumasaki-geri. Japanese fighter, Kikuno Katsunori has used it to some degree, as has Lyoto Machida. Most recently, Erick Silva has used it with greater success, dropping several opponents with kicks to the body using the tips of his toes. The longer people train for competition, the more likely they are to utilize techniques that are more complicated, or take more training. This technique may never become extremely popular, but I suspect we will continue to see it from time to time. We are all taught about "The Five Senses," when we are children, but in truth, there are far more "senses" than that. One of them is the sense of "body awareness"--that is, knowing where your body parts are in space without seeing them. This sense can be used to make striking a moving target much easier. If you were to close your eyes and hold out your hand at a random point in the air, you could slap it with your other hand quite easily. The same is true if you put that hand on your opponent's head. Wherever their head moves, your hand moves, and wherever your hand is, your other hand can find it. In the heat of combat, this awareness gives you a shortcut to accuracy, and negates the need for clear vision—something that you may not have, between the adrenaline-induced tunnel vision, taking punches to the face, and getting sweat and blood in your eyes. This also has the added benefit of being able to push and pull your opponent into your strikes for greater effect. 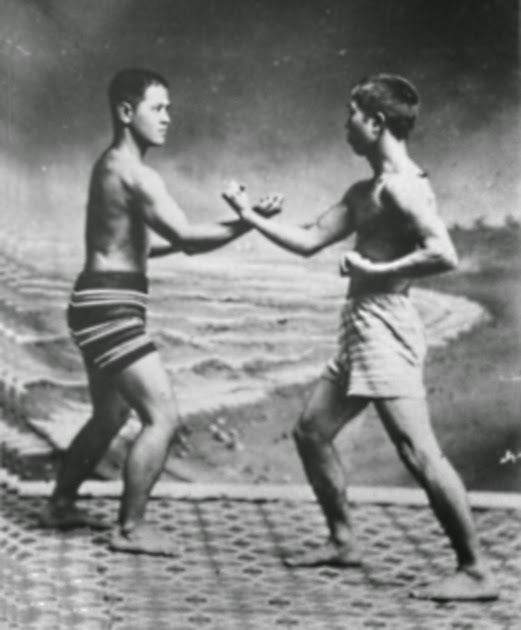 In Muay Thai (the most popular striking art for mixed martial artists to study) this is most often done from a "single collar tie," striking with the elbow; a technique we can see in Naihanchi. Now, we are seeing more fighters use the same technique for punches and kicks, as well, and I suspect that trend will continue. It becomes particularly useful when your opponent is dazed, attempting to clinch, or being overly defensive. Classical Okinawan martial arts make use of standing joint locks (classified as "tuidi") in conjunction with strikes and takedowns. This aspect of these arts is less widely-known than the striking aspect, but plays a valuable role in enhancing the strikes and takedowns. A seemingly large number of martial artists, both inside and outside the karate community, believe that these techniques are too impractical to use, and so they have neglected them. As the striking in mixed martial arts competition evolves, so will the trapping and grip-fighting aspects. It is in this realm that tuidi is most useful--using your opponent's grip and resistance against them. Unlike the joint locks that are commonly taught for combat sports, tuidi is typically a means to an end, as most tuidi-waza are not intended to be submission holds. Instead, they are used to wrench the joint to cause pain and damage, before moving on to other techniques if the opponent continues to fight. Sometimes, they are used in judo as a distraction, despite being technically illegal, and widely regarded as ineffective. 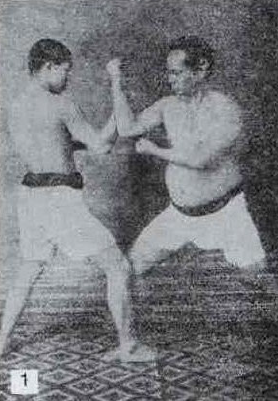 Aoki Shinya used a tuidi technique found in the "stacked hands" position of Naihanchi during his fight with Keith Wisniewski in the Japanese MMA organization, Shooto. That technique ended the fight immediately. More recently, Frank Mir and Jon Jones have both made use of a shoulder-wrench found in Naihanchi Sandan. This is something that I expect to increase in popularity as fighters realize that the context within which they can be utilized does exist within MMA. In this case, I am using "muchimidi" in a very general sense, to refer to fighters using their hands/forearms to trap, jam, follow, and grip-fight with their opponents. This is an aspect of fighting that has been largely ignored within mixed martial arts competition, due to the fact that emphasis is placed on clinching range and punching range, without addressing the area in between. Typically, if fighters do anything other than continue to throw punches at this range, they will either back away, try to close the distance to clinching range, or shoot in for takedowns. These are much easier strategies than muchimidi, and require less training to be effective, so they are very popular strategies. If any hand trapping had been going on, it was mostly hikite (pulling hand) being used to move an opponent’s guard out of the way, but even that hasn’t been popular until recently. Over the past couple of years, however, we have seen the rise of muchimidi in MMA. Jon Jones likes to use it, because of his reach, to keep his opponents in elbow range, but that is a very rudimentary use of the concept. UFC Bantamweight Champion, TJ Dillashaw, uses it to jam his opponent's lead hand, forcing them to punch with the other and making it easier for him to defend against, which is a more complex usage. The most extensive use of trapping in mixed martial arts, recently, has been by Robbie Lawler and Matt Brown. Both fighters have a tendency to grab at their opponents' hands, follow the hands, and jam strikes. When they fought each other, this hand-fighting was especially prevalent. As fighters improve their striking and clinchwork, I suspect we will see more of them venturing into this middle ground of "trapping range." That will bring with it a rise in tuidi-waza, supported strikes, and close range strikes, such as the ones described here, as they fit very well into this area of fighting.